Ferritic steels have a body-centered cubic (BCC) grain structure, but the austenitic range of stainless steels are defined by their face-centered cubic (FCC) crystal structure, which has one atom at each corner of the cube and one in the middle of each face. This grain structure forms when a sufficient quantity of nickel is added to the alloy—8 to 10 percent in a standard 18 percent chromium alloy. In addition to being non-magnetic, austenitic stainless steels are not heat treatable. They can be cold worked to improve hardness, strength, and stress resistance, however. A solution anneals heated to 1045° C followed by quenching or rapid cooling will restore the alloy's original condition, including removing alloy segregation and re-establishing ductility after cold working. Nickel-based austenitic steels are classified as 300 series. The most common of these is grade 304, which typically contains 18 percent chromium and 8 percent nickel. Eight percent is the minimum amount of nickel that can be added to a stainless steel containing 18 percent chromium in order to completely convert all the ferrite to austenite. Molybdenum can also be added to a level of about 2 percent for grade 316 to improve corrosion resistance. Although nickel is the alloying element most commonly used to produce austenitic steels, nitrogen offers another possibility. Stainless steels with a low nickel and high nitrogen content are classified as 200 series. Because it is a gas, however, only limited amounts of nitrogen can be added before deleterious effects arise, including the formation of nitrides and gas porosity that weaken the alloy. The addition of manganese, also an austenite former, combined with the inclusion of nitrogen allows for greater amounts of the gas to be added. As a result, these two elements, along with copper—which also has austenite-forming properties—are often used to replace nickel in 200 series stainless steels. The 200 series—also referred to as chromium-manganese (CrMn) stainless steels—were developed in the 1940s and 1950s when nickel was in short supply and prices were high. 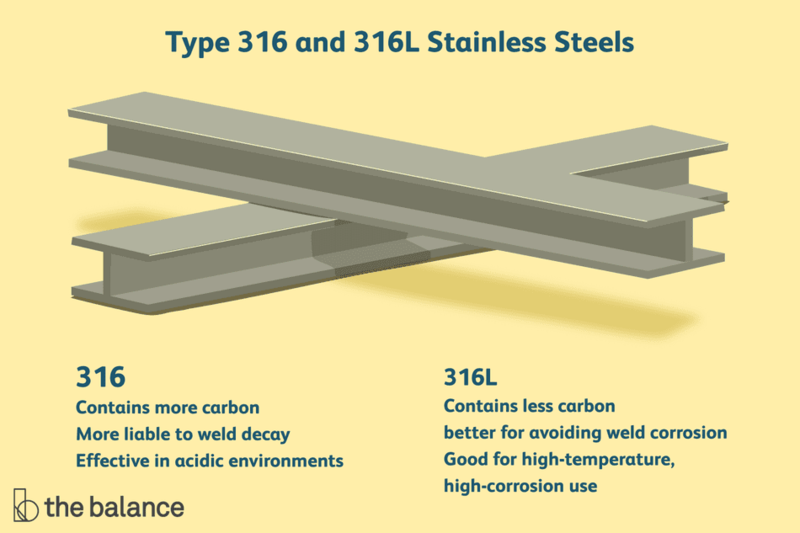 It is now considered a cost-effective substitute for 300 series stainless steels that can provide an additional benefit of improved yield strength. Straight grades of austenitic stainless steels have a maximum carbon content of 0.08 percent. Low carbon grades or "L" grades contain a maximum carbon content of 0.03 percent in order to avoid carbide precipitation. Austenitic steels are non-magnetic in the annealed condition, although they can become slightly magnetic when cold worked. They have good formability and weldability, as well as excellent toughness, particularly at low or cryogenic temperatures. Austenitic grades also have a low yield stress and relatively high tensile strength. While austenitic steels are more expensive than ferritic stainless steels, they are generally more durable and corrosion resistant.